We spent over 25 hours researching and testing 20 different types of youth baseball gloves and found that weight of the glove, features the glove has, and hand orientation were most important. The Rawlings Renegade Youth Glove scored high above the other gloves we tested in all categories and is our top pick. The leather construction of this 12” glove makes it easy for young players to break in. It is large enough for softball and baseball and the leather laces made it easier for little ones to open and close the glove. It makes a great first glove. Baseball is America’s national pastime. It can be played by both the young and old and is one of the most popular sports in the country. People of all skill levels enjoy the game beginning as early as age 3. With young players beginning T-ball at ages 3 or 4, glove manufacturers have created a full line of smaller gloves to fit young players hands and help them develop the skills they need to advance in the game. Baseball was first played in 1861 and was played on local sandlots. The first professional teams began in 1871. Just 10 years after the first games were played, the World Series was born. Today nearly every major city has a major or minor league team that keeps the sport’s popularity alive for the next generation. Children at very young ages like throwing things, especially balls. This makes baseball, or tee ball a great way to start a child in sports. One of the best ways to help a child learn to love sports and outdoor activities is to start with positive experiences. Buying a cheap glove that is hard to handle will result in frustration and tears, rather than joy and positive experiences. When a child is first learning to throw and catch a ball they must be able to close the glove and secure the ball. Gloves that are designed with these features in mind are easier for children to manage and will result in faster development of skills. Baseball is an American past time that families still enjoy. There is nothing like playing catch in the back yard with your child or grandchild. Watching them learn to hit the ball and the sheer joy they feel as they run across home plate. These times with our children or grandchildren bring back fond memories of our own childhood. With the popularity of the sport and the wide selection of gloves on the market, how do you decide which glove will be the best one for your child. 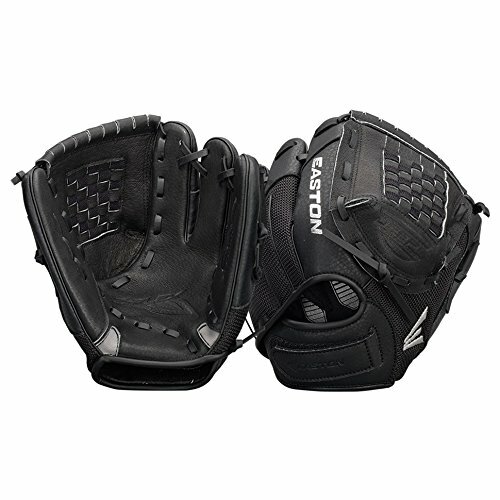 Youth baseball gloves range in price from around $10 to over $40. Which one should you choose? You may not even know how much they will like the sport when you are buying their first glove. Buying an economical, yet quality glove will give them the best shot at success. Our objective is to provide you with the information you need to make the best decision for your child or grandchild. We have created a buyer’s guide to help you decide which features are most important for your child under the conditions the glove will be used. We have also selected the best gloves on the market that are designed for players just getting started in the game. This will help you select the best glove for your budding superstar. 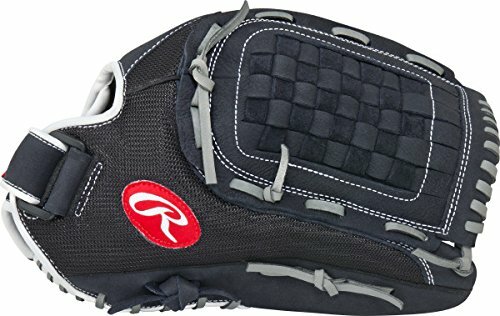 The Rawlings Renegade Youth Glove 12 inch is a top pick because of the all leather construction, which is easy for young children to break in. When children are learning to catch they need to be able to close the glove and keep the ball in place. This glove is designed with minimal break in needed, so it is ready to play with when it arrives. The glove requires about 20% player break in. The pocket of the glove features a basket weave pattern that increases the flexibility of the glove and makes it easier to catch the ball. This 12 inch glove is large enough to be used for softball or baseball and makes a great first glove for your little leaguer. The glove is made from full grain leather giving it a soft feel that is easy to control. The leather laces increase the flexibility and make it easier for little hands to open and close the glove. Rawlings makes a full Renegade line of gloves so your child can stick with this top brand throughout their baseball or softball career. 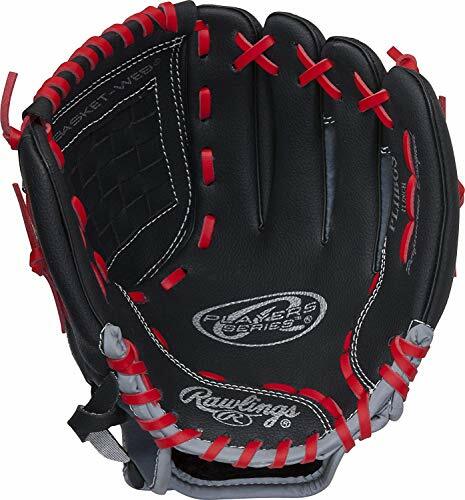 The Rawlings Renegade Youth Glove also features a closed fastback that is overlapping. This adjustment allows players to have a good fit on their hand. The palm of the glove has additional cushions and the fingers are also lined. 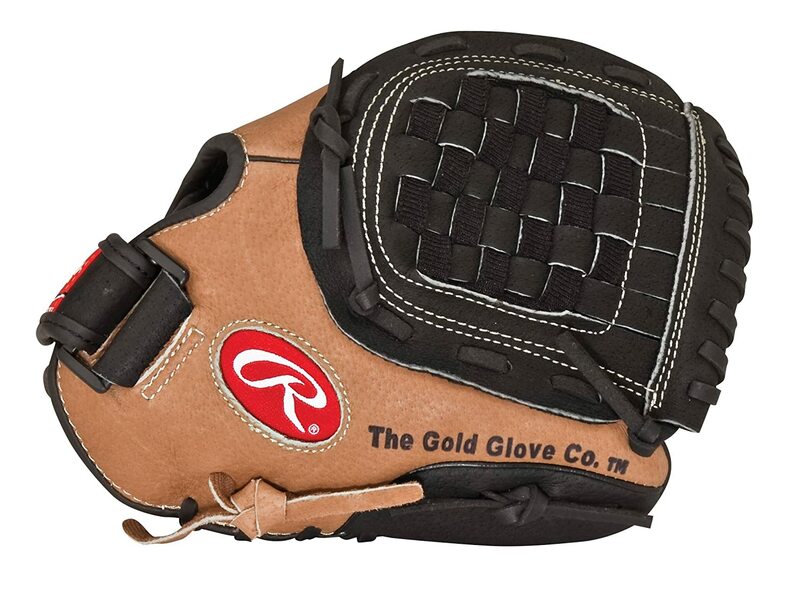 The Rawlings Renegade is available in both a right hand and left hand option, providing a starter glove that will have your child or grandchild loving the game as much as you do. Customers love the leather feel of the glove. So many first gloves are rough and difficult for little ones to manage and control. The soft leather found in top of the line gloves is easy to break in and easy for young children to control. The leather is also easy to care for and takes a beating, as many young children have not yet learned how to care for their equipment. This glove stands up to abuse and will last several years, until their hand or skill level grows out of it. It will fit players up to 12 years old depending on their position and skill level. The Easton Z Flex Right 10 InchGlove is a top pick because it is designed for young players and requires very little break in time. The glove is available in both a right and left handed option and will have young players catching the ball in no time. The Easton Z Flex Glove features an extended stall length for the fingers. The palm design makes it so it is easier to close the glove once the ball is caught. Easton believes one of the key features for young players to increase their skill level is the ability to close the glove easily. As a result they have built into each glove elastic straps which are placed on both sides of the palm. This patented design called Z-Flex allows even the youngest child to close the glove with ease. Combine this with an ultra-soft leather and it becomes a very flexible glove that can be used on arrival. While all gloves need to be broken in, this glove is soft without any treatment and includes needed features that make the glove very easy for young children to use. 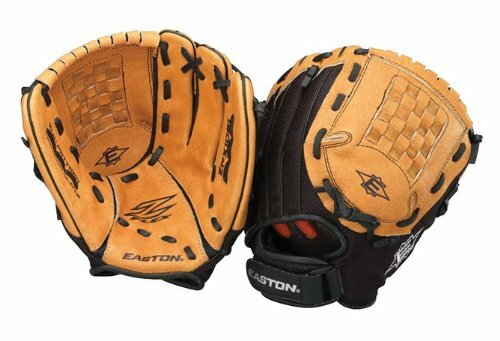 The Easton Z Flex Glove Right 10 Inch also has a web pocket that is 40% larger than standard 10 inch gloves. This provides a large pocket for the ball to fit. It will accommodate both baseballs and softballs with ease. The other unique feature of the Easton Z-Flex glove is the 2-1-1 design. The last finger slot combines both the ring finger and the pinky into the same sleeve. This gives the child more strength and more control to close the glove. Most young children do not have good control over their pinky movements. The glove also has a strap around the wrist which provides an adjustment. This enables your child to have a tight fit around the hand and will prevent the glove from falling off or being lose while they are using it. The glove keeps in mind that young children do not fully understand how to care for their glove. The all leather material and tight weave of the strings will hold up to abuse and still keep its form. This glove can accommodate children up to the age of 12, depending on their hand size and skill level. Customers love that this glove is so easy to handle. Children as young as three can operate the glove and get it closed around the ball, keeping the ball in the glove once it’s caught. The glove design has all the features needed for young children to master the art of catching a baseball. This leads to less tears and frustration on the part of the child and speeds up the process of learning the basic skills of the game. The glove is perfect for T-ball players and coach pitch ball. The Rawlings Players 11 Inch Baseball Glove is a top pick because of its high quality construction. This glove has a basket weave pocket that is deep and large enough to secure the ball after it has been caught. The lacing and patterns keep its form and is easy to close. This glove is recommended for players that are just starting out in the sport of baseball and is perfect for 3 to 5 year olds. The glove is made of a soft material that does not require a lot of time and effort to break in. 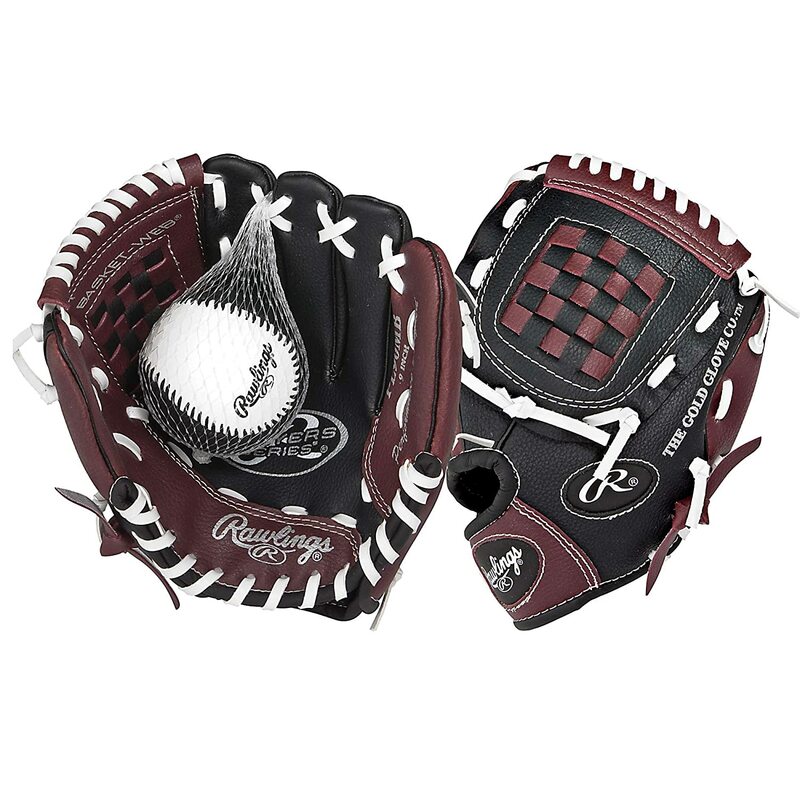 One unique feature with the Rawlings Players 11 Inch Baseball Glove is that is comes with a soft core training ball. This ball is softer than a traditional baseball and will not hurt as much if the child is hit with the ball. This can be very beneficial as they are learning the art of catching and developing the eye hand coordination needed to catch a baseball consistently. The Rawlings baseball glove comes with both right and left handed options. It is best for children starting out in T-Ball and are just learning the rules of the game. It is designed for small hands and is soft enough to close easily as they develop their hand muscles to grip the ball. Customers love this beginner glove because it is a good fit and does not need a lot of breaking in. The soft leather feels good right out of the box and can be used immediately. They also like the small size that is not cumbersome for a small child just beginning to learn the sport of baseball. The web designed pocket helps keep the glove in place leading to a successful catch. Each of the top rated gloves is a different size. The size needed will depend on the size of your child’s hand, their skill level and what position they are playing. Each glove also has adjustable straps, which provides flexibility and will leave room for the child to grow. A more coordinated child may be able to handle a slightly larger glove sooner. The two key features for any child’s glove are the ease of closing the glove and the ability to keep the ball in the pocket, once it is caught. Each glove offers different features to accomplish these two key tasks. All three are made with a soft leather material that does not require much break in time. The estimated amount of break in is measured at 10% for the Rawlings Players and the Easton Z-Flex. The Rawlings Renegade is estimated to need 20% break in by the player. They each also feature a weave pattern that builds a deeper closed pocket in order to keep the ball in place once it is caught. The Rawlings Players Glove is the smallest glove and is designed for children ages 3 to 5. If you have a small child just starting out this makes a great starter glove. If you have more than one child playing or don’t want to replace the glove so soon, the 10 or 10.5 inch will work and the wrist adjustments can be tightened for a more secure fit. All of the gloves have been successfully used by payers as young as 3. The Easton Z-Flex glove has elastic around the palm and combines the ring finger and pinky in the same finger slot for better control and easier closing. This is a 10 inch glove and can be used for children up to the age of 12. This would provide one glove that will last through several seasons of playing before needing to be replaced. The Rawlings Renegade is a 10.5 inch glove and built for young players up to the age of 12. It requires the most break in by the player and is the largest glove of the three. It however, is made with a pigskin leather that is softer than traditional leathers and makes a very comfortable fit on the hand. This glove is small enough for T-ball players and can be used for coach pitch and standard play as well. Both the Rawlings Renegade and the Easton Z-Flex are large enough for both softball and baseball play. Each brand has a full line of gloves allowing you to stick with a brand you like, as you upgrade to larger gloves as your child grows. What is a Youth Baseball Glove? Baseball is a popular American past time that is enjoyed by millions each year. There are only a few basic pieces of equipment needed to enjoy the game. These include a glove, a ball and a bat. With a glove and ball you can play catch in the back yard and improve throwing and catching skills which are needed for game time. Youth gloves are typically less expensive than an adult glove and is made with lighter and lower quality leathers. This helps keep the price down. They also feature thinner finger slots and are designed to be easier to close. Young hands do not have the strength or coordination to manage larger gloves so the smaller size and weight is important for skill development. Generally children between 10 and 12 can use either a youth or adult glove depending on their skill level. Children under age 10 are better with a youth glove and those over 12 are better with an adult glove, even if they have smaller hands. Fingers –are either in the shape of fingers for infield, outfield and pitchers gloves, or the shape of a mitt, with no individual finger slots for catchers and sometimes a first baseman’s glove. Pocket – is the space between the thumb and index finger where the ball rests when it is caught. Palm – is where the glove covers the palm of the hand. Heel – is where the glove covers the heel of the hand. For gloves that have fingers (infield, outfield and pitching gloves) the glove is measured from the heel to the top of the index finger (the tallest part of the glove). For mitts (like a catcher’s glove) it is measured as the circumference of the glove. Youth gloves range in size from a size 8 to a size 12, with 9 to 10.5 being the most commonly used sizes. The size you choose will be determined by the child’s age, skill level and the position they are playing. Once they reach the age of 12 they should move to an adult size because the design is different for youth gloves. Gloves needs are different based on the position the child is playing. Positions have different glove styles that are made to meet the needs of that position. For children just starting out a basic glove is all that is needed. As their skill level improves different positions will benefit from gloves made specifically for where they are playing on the field. Infield players typically use a glove from size 8 to size 11 inches. This is a size that will allow them to catch ground balls and quickly get the ball out of the glove so it can be thrown.The pocket is often more shallow so the ball is easy to release and throw. They come in either open and closed pockets or weaves. Third baseman may use a larger glove to catch line drives, where a second baseman may choose a smaller one for quicker throws to first. Outfield players under the age of 8 will handle an 8-11 inch glove the best. For players over the age of 8 they might be able to handle a 10- 12 size glove depending on their skill level. The longer fingers offer ease of catching fly balls and gives the player a maximum reach. They also have large deep pockets to hold the ball safely after a catch. Pitchers gloves are often smaller and are focused on comfort rather than performance. The gloves need to be large enough to hide the pitchers ball so the batter cannot see the type of pitch being thrown. The gloves often have a lighter weight than traditional gloves and always have a closed weave. Youth pitching gloves are generally 8 to 10.5 inches. First Basemen generally like a longer glove when they are over 8 years old and use a size from 11 to 13 inches. Children under age 8 generally use an infielder glove. This allows them further range for catching balls and still gives them the ability to get balls out of the dirt. First base gloves are also available in a mitt form and often have a pocket that is shallow with an open web design. This helps get the ball out quickly after a catch. Catchers have special gloves that don’t have individual fingers and is more of a mitt. The larger closed pocket is built for catching a lot of balls comfortably. The gloves include extra padding to catch fast balls frequently without hurting the player’s hands. These gloves also have a deeper and stiffer pocket for easier entrapment of the ball. If your child is catching then a catcher’s glove will go a long way to their playing enjoyment. Glove sizes for youth are generally 29.5 to 30 inches for players under the age of 7. For those 8 and over the size is usually 30 to 31 inches. Baseball gloves have a number of different features that help the player master skills of the game and to play better. When a child is first starting out these features and various glove styles are not as important. As they progress in the game, having a particular kind of glove with certain features will improve their game based on the position they like to play. Pocket of the glove. The size of the pocket needed is best determined by the position your child is playing. Shallow pockets are best for infielders and first basemen where a deeper pocket is generally used for outfield positions. Catchers have deep pockets in the mitts, but this requires a specialized glove built specifically for catching. Backs are either open or closed. This is mostly a personal preference. Open backs offer more flexibility with the glove, where the closed back offers a tighter fit. Wrist Adjustments are found with most gloves. Some adjust with a Velcro or leather closure where others require a simple re-lacing to adjust the size. High end gloves are generally re-laced. The Velcro adjustment is faster and easy to make the adjustment, but the Velcro can come loose easily. Buckles and latches are also available on some gloves, which provides a simple way to adjust the fit of the glove, while keeping the adjustment tight. Webbing determines how the pocket of the glove is built. Closed webbing does not leave any space between the woven leather. Open pockets allow space between the weaving. Closed webbing offers more support and are most often used by outfielders and pitchers. Catchers always use closed webbing because they want a stiffer glove. Pitchers use closed webbing to hide their hand movements before the pitch. Infielders tend to prefer open webbing because it provides a faster release of the ball. Padding will vary based on position as well. Catchers gloves with have the most padding where a pitchers glove will have the least. Infielders and outfieldershave padding levels in the middle. When the ball is caught perfectly in the pocket the ball does not sting the players hand. When a very fast throw is caught in the palm or on the fingers it can sting. Higher levels of padding reduces the impact of fast throws. When you first get a new glove you should oil it down with oil designed for leather and baseball gloves. Using household oils could result in the leather breaking down and not lasting as long. Use a small amount of oil and rub it in. If needed reapply. It is better to reapply than to put too much oil on the glove. After it is well oiled then work the glove with your hands by moving it around. This will make the glove more flexible. Once this has been completed place a baseball or two in the glove and wrap it up. You can use a belt to wrap it. This helps the glove shape to the ball size you will be using. Many players will put the glove under their bed. The pressure of the mattress helps the glove mold to the shape of the ball. Once the glove is broken in it is a good idea to leave a ball in the glove when it is not in use. This will help prevent the glove from going flat again and will help it keep its shape. With practice and use the glove with develop a nice pocket which will hold the baseball better and prevent the ball from popping out easily. Leather is the most common material used to make gloves. The type of leather is a major factor in determining cost and softness of the glove. Softer leathers like pigskin are very comfortable and strong, but generally cost more than cow’s leather. Treated leather uses chemicals to soften the leather and make the glove more pliable. This treatment increases the durability of the glove and results in the glove being broken in faster. Synthetic material leads to less expensive gloves and lighter weights. They will not last as long as leather gloves and are often firmer and harder to control and break the glove in. This can lead to frustration as youngsters are learning the game. The baseball glove you purchase for a young player will impact their ability to control the glove and catch the ball. While you may not know their level of interest in the game until they have played for a season or two, having a good quality glove will impact their ability to learn. Inexpensive gloves made of stiff material will be hard for the child to handle. It is not necessary to spend a lot on a youth baseball glove, but getting a good quality glove will pay off as your child learns to love the game.